We love going to the movies. Whether it's an excuse to eat popcorn blockbuster style movie or a film no one has ever heard of, Mr. Deep and I really enjoy spending a few hours in a dark cinema. When we lived near Newburgh, NY there was a small, independent movie theater called the Downing Film Center and it was one of our regular hang outs. The Downing was located along the Hudson River waterfront, a revitalized area in the midst of a very run down city of Newburgh. The theater was owned by two retired teachers and was housed in the basement of an old brick building which used to be an art gallery and before that was probably a factory of some kind. There were only about 50-60 seats in the whole place and you had to get their early to get one of the "good chairs." The good chairs were large, came with pillows and reclined a little. The bad chairs were like something you'd sit on in a police station while your statement was being taken. We would often arrive early, sit at the bar across the street, watch the theater out the window and when people started going in we would throw money on the bar, run out and over to the theater to make sure we got a good seat. The Downing had home-made popcorn and you could also bring in your own food and wine if you wanted. 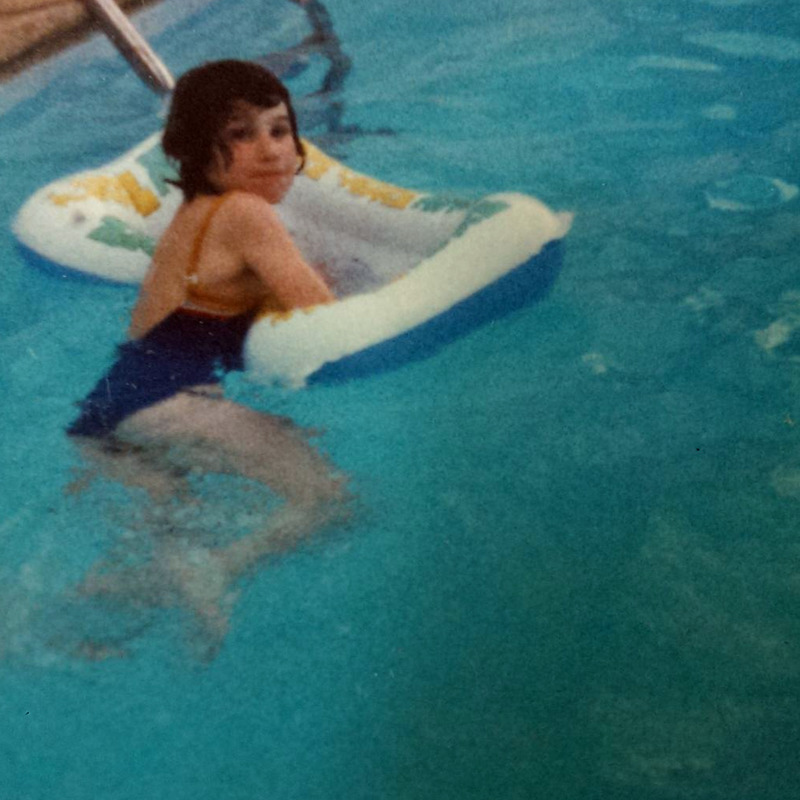 Then when we moved to White Plains, NY and things got fancier. If you have been to this part of New York you know that everything is fancier in Westchester County. While living there we would visit the Jacob Burns Film Center in Pleasantville. Much more upscale than the Downing, Jacob Burns had multiple screens but showed a lot of unusual movies that you wouldn't find in the regular theater. We liked to go and have lunch at this place by the train station, where the maitre d' was always extremely excited to see us, greeting us like we were long lost cousins, even though we only went there a few times. Following lunch we would walk over the movie. 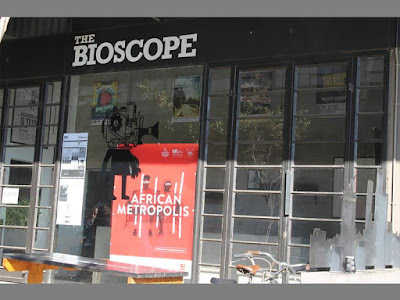 Given this extensive history, you can imagine how thrilled we were when we first laid eyes on the Bioscope Independent Cinema in downtown Joburg. Shortly after we arrived some friends of friends who live here took us to the market on main in the Maboneng area of Joburg. Maboneng is like a little oasis of gentrification in the much vilified Joburg CBD. Maboneng actually means place of light in Sotho. While we were in Maboneng we saw the cinema and agreed to come back and see a movie there. Of course life got in the way and we never did go - until this past weekend. Cobain's death had been a ruled a suicide, but the movie casts down on that theory and indicates that he may have been murdered. The movie was a little bit too TV police drama for me with reenactments of Courtney Love holed (pun intended) up in a hotel room in LA barking out orders to her minions and such, but it was interesting. Mr. Deep really enjoyed the movie, but Mr. Deep as you may know LOVES a good conspiracy theory so the fact that he liked this movie is not a surprise. I will admit when we were heading down to the theater, we, or at least I was wondering if was a good idea. All of that talk about staying out of the city is in your head and there were people in park keeping warm by a fire in a trash can, lots of burned out buildings and such, all making you think you might turn into a statistic. We made it safely and had some time to kill so we went to the restaurant next door called the Pata Pata Restaurant. In looking at their website they refer to themselves as an African Diner. What a great place! Mr. Deep ate an Impala leg dinner while we were waiting. When we walked over to the theater, the box office was in a bar/cafe. We had purchased upgraded tickets that included pizza and a glass of beer or wine. Mr. Deep passed on the pizza since he was full on Impala. I expected that we would get a slice of pizza but no, you get a whole personal size pizza and you can even get toppings if you want. The woman at the counter said they would bring the pizza into the cinema and deliver it to us when it was ready. We also each got a drink with our tickets and we could go out and buy more drinks if we wanted. At this point, I think I could end this post because clearly the Bioscope IS the greatest movie theater on earth. A picture of the outside of the theater. I found this online since I didn't take a good one. I will continue the post because I want to share a bit about the inside of the theater. The seats are all seats from cars. No more bad seats or good seats like at the Downing. Also even though there are only about 50 seats there is stadium seating so there is truly not a bad seat in the house. Just noticing that each seat is named for a movie star. I don't know who Sam Dalais is? I can't wait to return to the Bioscope to see another movie. 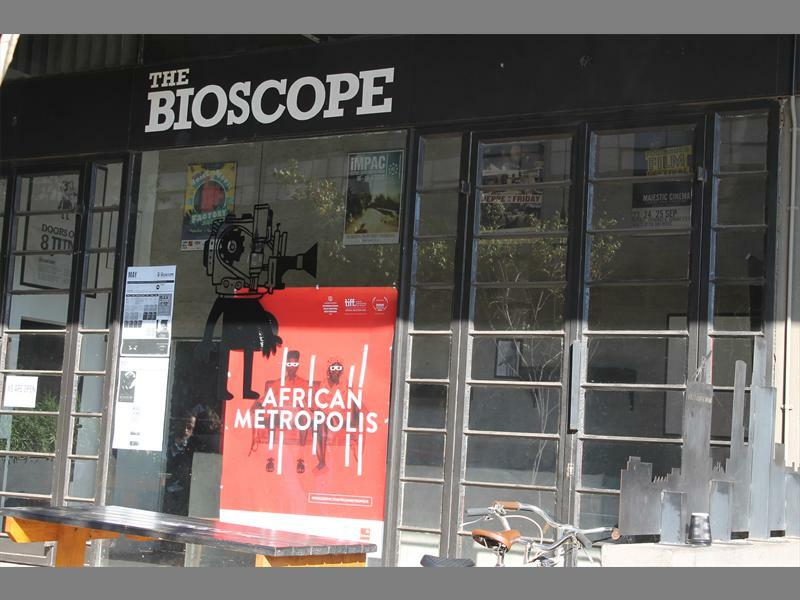 If you live in the area, or will be visiting, here are the websites for the Bioscope Independent Cinema and Pata Pata. I highly recommend both. The theater in Newburgh sounds like the old Third Street Theater in Troy (precursor of the Spectrum in Albany). It would be fabulous if the Crandell in Chatham got those comfy seats. Neat post. I'm as interested in the restaurant as I am the theater. I'd love to know why they chose car seats. Probably more economical or got a good deal. As to the CBD, it is rapidly gentrifying/renewing and I think there is much hope for the downtown if the ANC can keep from destroying the country. I remain very optimistic. As to safety I feel that daytime yes and nighttime no is a good rule of thumb unless you feel really good about taking the risk.